ESPN college basketball analyst Bob Knight morphed back into The General when he took the opportunity to yell at fans to sit down DURING THE COURSE OF PLAY WHILE ON THE AIR. In one of the most surreal announcing moments we’ve ever seen, Knight is so fueled by rage over having his vision blocked that he either A) Forgets he’s live on the air or B) Just doesn’t give a crap. Isn’t this what the cough button is for??? This is phenomenal. Before we saw this video, we had forgotten Knight was even still working for ESPN. 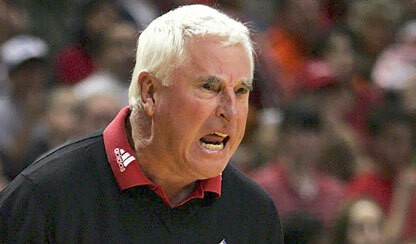 He still does, and he’s still the same Bob Knight. We can only presume he didn’t throw his chair at them during the media timeout. We’ve questioned why ESPN has held on to Knight for all these years when he really hasn’t panned out as a television personality. Now we know why – for this one shining moment.